Dasani Sparkling Water. A great way to add refreshment to your day. 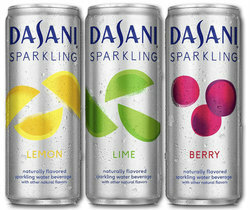 Dasani Sparkling is unsweetened with no artificial flavors and zero calories. Each 12 oz can is naturally flavored and is packed in convenient 8 packs. Choose from Berry, Lemon, and Lime. Naturally Flavored with no artificial flavors or sweeteners. Each 12 oz can has zero calories. Available in convenient 8 packs. Three great flavors to choose from: Berry, Lemon, and Lime. ****Coke is changing the packing for this product. We have the Lemon in the 12 Count Fridge Packs and the Lime and Berry are in the new 8 packs.